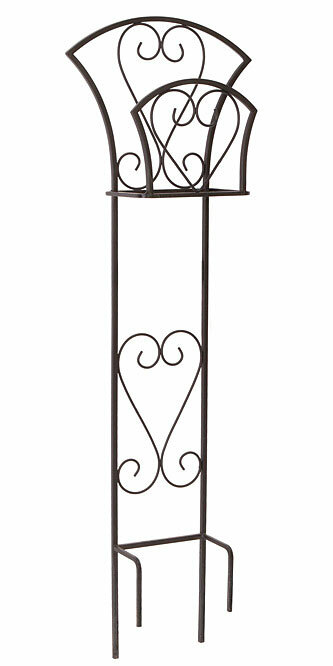 Help your lawn remain beautiful and organized with this Panacea Black Scroll Hose Hanger. The traditional scrolls, black color, and hardy frame make this hose holder a fantastic addition to your garden, and its free standing design ensures versatility in placement. Round, steel rods create a sturdy frame, and extra pieces extending outward near the top form a hardy basket to accommodate your hose. Thinner rods adorn the interior, bringing wonderful design to the piece, and the black finish enhances any setting. Two step-in legs at the base of the item allow you to insert it easily into soil, and their front orientation helps balance the weight of your hose. The steel body remains durable for many seasons, and the unique front extension keeps your garden hose tidy and within reach. Add an elegant hint to your garden watering products with this Black Scroll Hose Hanger. Made in the USA.